The CEEH was privileged to host the annual meeting of the NIEHS-Funded Environmental Health Sciences Core Centers in Seattle, April 17-19. The program included Scientific Symposia and sessions for Center Directors, Administrators, and Community Outreach and Engagement Cores (COECs). Howard Frumkin, Dean of the UW School of Public Health welcomed participants to Seattle with a lively presentation about the environmental health of the Seattle area and Washington State. 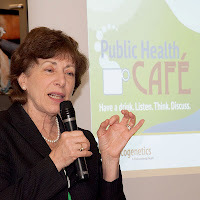 NIEHS Director Linda Birnbaum also welcomed participants to the meeting, provided an update of NIEHS programs and priorities, and participated in a Public Forum held in conjunction with the meeting. The topic of Science Symposium #1 was The Implications of the ENCODE Project for the Future of Genetic-Environment Interactions Research. Keynote speaker and CEEH Member John Stammatoyannopoulos spoke eloquently on "Genes, Chromatin, and Common Disease". The ENCODE Project aims to identify the functional elements encoded in the human genome and has the potential to uncover genetic-environment interactions and epigenetic regulation in human responses to toxicants and disease susceptibility. Science Symposium #2, Emerging Issues in Global Environmental Health, featured a key note from Theo Vos on "Global Burden of Disease 2010: Focus on the Environment." Dr. Vos wowed the audience with his realtime demonstrations of GHDx, an interactive online resource for demographic and health data created by the Institute for Health Metrics and Evaluation (IHME). The GHDx directly supports IHME’s mission to improve the health of the world’s populations by providing the best information on population health. Breakout sessions addressed the topics of hydraulic fracturing, preparing the next generation of environmental health scientists, and strategies to build bi-directional communication. Ten young investigators from Environmental Health Centers across the country presented their research on topics ranging from bioinformatics to electronic waste recycling to phthalates. The COECs worked together to create a "History Wall," pasting photographs and other memorabilia onto a timeline spanning the 50-year history of the EHS Core Center program. The History Wall introduced those relatively new to the Centers to the important work of the COECs and provided valuable information to those wishing to create new collaborations between COECs. Sessions for the Directors focused on scientific presentations, long-range evaluation, strategic planning, and future steps for the EHS Core Center program. Administrators and COECs met separately in dedicated sessions to discuss topics of interest and value to them. Each year, in conjunction with the meeting, the host institution is encouraged to hold a public forum addressing a local environmental health issue. This year's forum was focused on the Duwamish River Superfund Site Cleanup. Stakeholders from EPA, Ecology, The Boeing Company, the Duwamish River Cleanup Coalition, CEEH, Public Radio International's Living on Earth, and the Muckleshoot Tribe gave brief "Lightning Talk" presentations about the Duwamish River and the proposed Cleanup Plan currently open for public comment. The EHS Core Centers meeting concluded Friday night with an educational boat tour of Elliott Bay. Participants had a chance to see the north end of the 5.5 mile Lower Duwamish Waterway Superfund Site; Lockheed West in West Seattle; and the former Wyckoff Co. wood treatment facility at Eagle Harbor, the main port of Bainbridge Island. CEEH scientists Evan Gallagher and Chase Williams spoke about current CEEH research projects related to the pollution in the Duwamish River and provided information about the other Superfund sites we passed on the tour. James Rasmussen, the Director of the Duwamish River Cleanup Coalition and a member of the Duwamish Tribe, spoke eloquently about the impacts of pollution on those living near the river and on Tribal members whose well-being is inextricably tied to the health of the river. A complete program for the meeting is available on the CEEH website. Photos from the Public Forum are available for viewing on our Ecogenetics Flickr page. Next spring’s EHSCC meeting will be held at the Southern California Environmental Health Sciences Center at the University of Southern California.